one of the world’s leading jugglers and a true visionary. Michael Moschen is an artist of manipulation and juggling, who performs with a wide range of objects. Critically acclaimed by such leading media as the Los Angeles Times and The New York Times who have called his work “genius,”“exhilarating virtuoso entertainment” and “flawless purity”, Moschen is known to have transformed ancient circus arts and turned them into a mesmerizing form of theatre. Incorporating the rich beauty of art, science, physics and mathematics, Moschen added the audience participation to a show of creative, fantastic and impossible feats of manipulation and illusion. 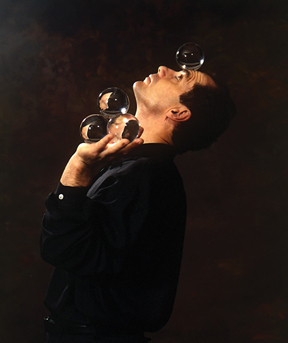 Ranked as one of the world’s leading jugglers and one of America’s most visionary performing artists, Moschen has performed both solo and collaboratively with leading artists Off-Broadway, in major concert halls, and on arts festivals in Europe, Asia and North and South America. His work crosses ethnic and social borders, and is greeted with standing ovations and critical acclaim in every country and audiences of all ages. Recognized by the McCarthur Foundation with the prestigious Genius Award, his work is seen often on stages, film and television. Here, Moschen performs his incredibly famous, jaw-dropping piece where three balls and a triangle become a musical and visual work of art. Michael Moschen has been associated with some of the leading circus arts performers of all times, including the Big Apple Circus, Bill Irwin in Not Quite/New York and The Courtroom, Fred Garbo and Bob Berky in the Obie Award-winning Foolsfire, Lotte Goslar’s Pantomime Circus, and Mr. Berky in the The Alchemedians Off-Broadway. He was also commissioned by Cirque du Soleil to create and stage a new work for their permanent theatrical circus in Las Vegas which has also toured with Quidam. Moschen played a key role in developing modern Ball Contact with his routine “Light” in 1985. It is still available to buy on video (Great performances, In Motion: with Michael Moschen, 1991). “Light” has stood the test of time well. It is a beautiful and mesmerising routine – recommended viewing for all manipulators. 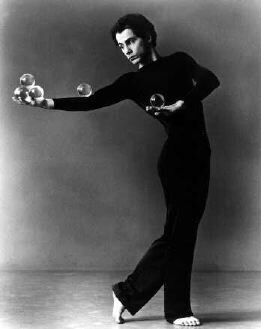 With Light, Moschen was the first to use transparent crystal balls, to create a performance which combined the existing techniques of one ball body rolling, palm rolling, palmspinning, ball manipulation and balance. An art form which would later be called “Contact”. Moschen developed much of the material in Light. He appears to work in his manipulation not with “moves”, but at a higher level, with pure techniques and concepts of movement. The following are accredited to Moschen: Palm Circle Isolations, Snakes and trains, 7 ball “Moschen Transfers”, Isolating 1 ball through 4 ball pyramid manipulations (e.g. isolated thumb-lifts), The Butterfly – However half butterflies, the cradle hold and head rolls [a butterfly on the head] existed previously. Each of these is a fundamental concept, representing not just one move but a whole family of moves. 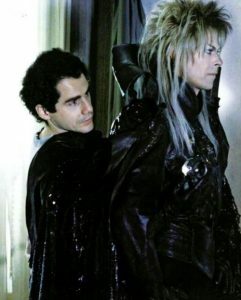 In a work beloved by Moschen aficionados, he choreographed and performed with crystal balls as David Bowie’s hands in the Jim Henson film Labyrinth. Moschen is deeply involved in understanding and sharing the physical and mathematical principles that underlie his work, and is a sought-after public speaker. He presented the Keynote Address for the National Conference of Teachers of Mathematics in 1996, and in 1998 for the Association of New York Teachers of Mathematics. He has lectured on innovation and creativity at such prestigious institutions as Carnegie Mellon, the Massachusetts Institute of Technology and the Lincoln Center Education Program. Featured in the book The Virtuoso: face to face with 40 extraordinary talents, Moschen is in constant demand for a wide range of corporate projects including industrial and educational films, live performances and lectures. He has received support form the National Endowment for the Arts and is a registered Touring Artist with the Connecticut Commission on the Arts and the New England Foundation on the Arts. 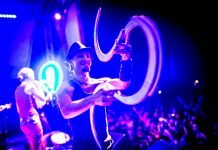 More articles on Circus & Flow Arts. 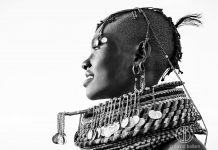 Watch Flow Arts – A Film ! Visionary Art on The Artistation.